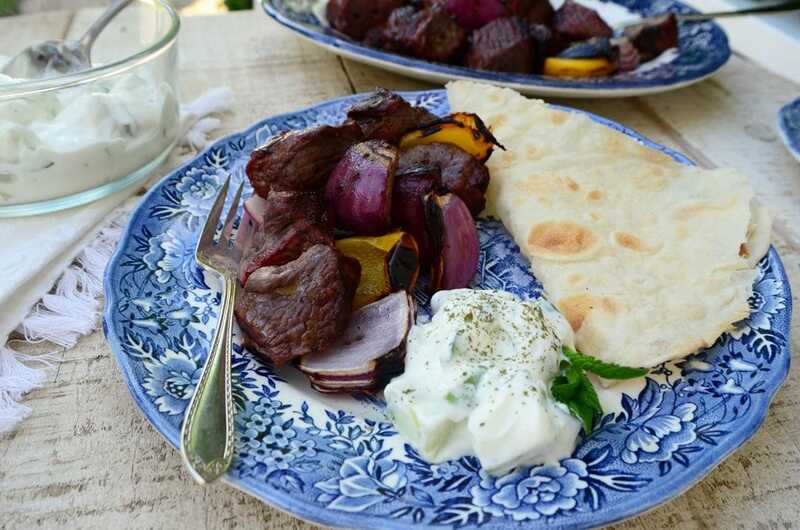 There is no better summer meal than laham mishweh--the grilled combination of lamb and onion is utterly mouth-watering. 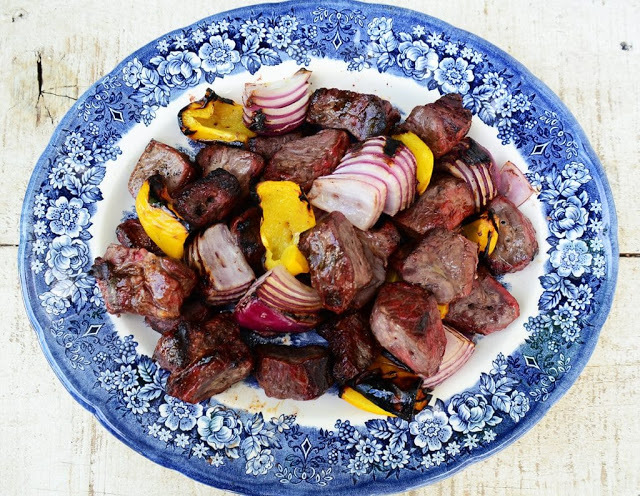 No marinade is needed! The key to proper grilling of the meat is to bring it to room temperature for a couple of hours before cooking. This ensures even cooking and prevents the exterior of the meat from burning before the interior is cooked. 1. Season the meat generously with salt and pepper, then let it rest and come to room temperature. 2. Heat the gas or charcoal grill to a level of medium high heat. Thread the skewers, preferably stainless steel, with a pattern of 2 pieces of meat, 1 chunk of onion, and one pepper, repeated. Or any pattern you like. Or no pattern at all. Just be sure not to thread the meat and vegetables too tightly, to give them room to cook fully and to enjoy more the grilled surface area. 3. Brush the meat and vegetables with olive oil. Place on the grill and for medium-rare meat, cook for 10 minutes with the top on, then flip with tongs and grill another 10 minutes, top on. 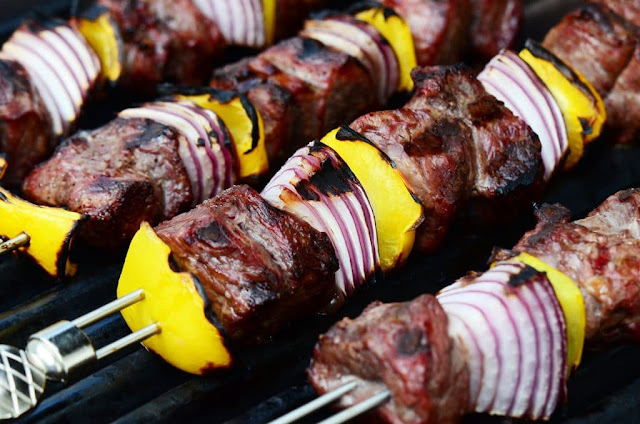 Remove from the heat and let the skewers rest for 10 minutes. 4. 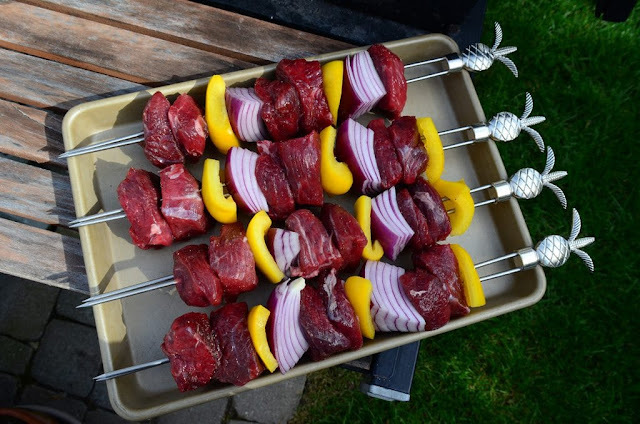 Remove the hot meat and vegetables from the skewers by pushing them off with a fork. Best not to serve the skewers, even small ones--it's awkward and difficult to remove the meat on the plate.